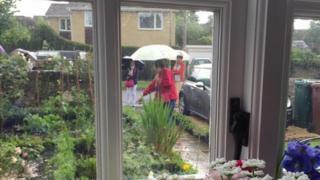 Chinese tourists are descending on an English village in search of "the true sense" of the UK, the BBC can reveal. Residents were baffled by coaches of sightseers arriving in Kidlington, Oxfordshire and posing for photos in front gardens and against parked cars. But a guide has now confirmed the tourists are attracted by the quiet houses and gardens. The guide was responding to a BBC question sheet that was handed to tourists. The tourists were first identified in Benmead Road and the Moors in July, the Spotted: Kidlington Facebook page reported. Anne Clifton, who lives in the Moors, handed the BBC's question sheet to a member of the tour party when they reappeared in the road on 23 October. She said: "I asked a woman standing at the door of the coach if she would be good enough to complete the form. "She was not actually one of the tourists, but was leading the party." Q: We are happy to have you here but why have you come? Translation: "Because we don't have [these] in China. Here, we are looking for the true sense of this country. " Translation: "[Yes]. Because the environment makes you feel you are closer to the simplicity of your original self." Q: What do you like here? Translation: "The houses [and] gardens." The tourists were a short walk from thatched cottages and a church but preferred to take photos outside modern houses. Previous theories for the cause of the influx included mistaken identity, a covert social experiment or possibly Oxfordshire's connection to Inspector Morse. Baz Daniels, who has lived in Kidlington for more than 20 years, said he had been in touch with a friend in China to try to get to the bottom of the tourist influx. "Kidlington is apparently being marketed by Chinese tourist agencies as a beautiful English village on the way to Bicester Village shopping centre," he said. "Many of the visitors live in cities and love to see things like the hanging baskets and little flowers in people's gardens."